In 1754, delegates from 7 of the 13 colonies as well as representatives of the Iroquois met in Albany, New York, which was then a frontier settlement, to organize for the purposes of forming a common defense against the French and their Indian allies at the outset of the French and Indian War, which was the colonial portion of the larger Seven Years’ War. Largely the brainchild of Benjamin Franklin, the Plan of Union proposed to create a grand council of colonies with the power to levy taxes, with a head of council approved by the king. 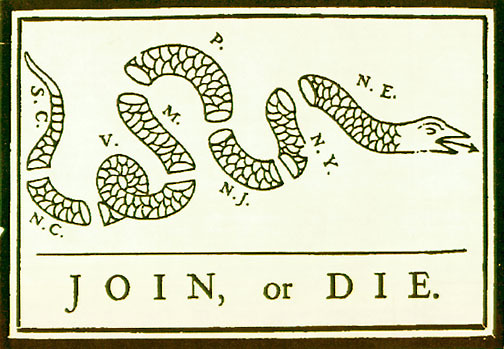 As part of his effort to promote this preliminary attempt at colonial unity, Franklin published the famous cartoon entitled “Join, or Die.” The group meeting at Albany approved the plan, but it was later rejected by both colonial governments and the British government. As you read, summarize the main purposes for this Grand Council. 1. That the said general government be administered by a President-General, to be appointed and supported by the crown; and a Grand Council, to be chosen by the representatives of the people of the several Colonies met in their respective assemblies. 3. — who shall meet for the first time at the city of Philadelphia, being called by the President-General as soon as conveniently may be after his appointment. 4. That there shall be a new election of the members of the Grand Council every three years; and, on the death or resignation of any member, his place should be supplied by a new choice at the next sitting of the Assembly of the Colony he represented. 5. That after the first three years, when the proportion of money arising out of each Colony to the general treasury can be known, the number of members to be chosen for each Colony shall, from time to time, in all ensuing elections, be regulated by that proportion, yet so as that the number to be chosen by any one Province be not more than seven, nor less than two. 6. That the Grand Council shall meet once in every year, and oftener if occasion require, at such time and place as they shall adjourn to at the last preceding meeting, or as they shall be called to meet at by the President-General on any emergency; he having first obtained in writing the consent of seven of the members to such call, and sent duly and timely notice to the whole. 7. That the Grand Council have power to choose their speaker; and shall neither be dissolved, prorogued, nor continued sitting longer than six weeks at one time, without their own consent or the special command of the crown. 8. That the members of the Grand Council shall be allowed for their service ten shillings sterling per diem, during their session and journey to and from the place of meeting; twenty miles to be reckoned a day’s journey. 9. That the assent of the President-General be requisite to all acts of the Grand Council, and that it be his office and duty to cause them to be carried into execution. 10. That the President-General, with the advice of the Grand Council, hold or direct all Indian treaties, in which the general interest of the Colonies may be concerned; and make peace or declare war with Indian nations. 11. That they make such laws as they judge necessary for regulating all Indian trade. 12. That they make all purchases from Indians, for the crown, of lands not now within the bounds of particular Colonies, or that shall not be within their bounds when some of them are reduced to more convenient dimensions. 13. That they make new settlements on such purchases, by granting lands in the King’s name, reserving a quitrent to the crown for the use of the general treasury. 14. That they make laws for regulating and governing such new settlements, till the crown shall think fit to form them into particular governments. 15. That they raise and pay soldiers and build forts for the defence of any of the Colonies, and equip vessels of force to guard the coasts and protect the trade on the ocean, lakes, or great rivers; but they shall not impress men in any Colony, without the consent of the Legislature. 16. That for these purposes they have power to make laws, and lay and levy such general duties, imposts, or taxes, as to them shall appear most equal and just (considering the ability and other circumstances of the inhabitants in the several Colonies), and such as may be collected with the least inconvenience to the people; rather discouraging luxury, than loading industry with unnecessary burdens. 17. That they may appoint a General Treasurer and Particular Treasurer in each government when necessary; and, from time to time, may order the sums in the treasuries of each government into the general treasury; or draw on them for special payments, as they find most convenient. 18. Yet no money to issue but by joint orders of the President-General and Grand Council; except where sums have been appropriated to particular purposes, and the President-General is previously empowered by an act to draw such sums. 19. That the general accounts shall be yearly settled and reported to the several Assemblies. 20. That a quorum of the Grand Council, empowered to act with the President-General, do consist of twenty-five members; among whom there shall be one or more from a majority of the Colonies. 21. That the laws made by them for the purposes aforesaid shall not be repugnant, but, as near as may be, agreeable to the laws of England, and shall be transmitted to the King in Council for approbation, as soon as may be after their passing; and if not disapproved within three years after presentation, to remain in force. 22. That, in case of the death of the President-General, the Speaker of the Grand Council for the time being shall succeed, and be vested with the same powers and authorities, to continue till the King’s pleasure be known. 23. That all military commission officers, whether for land or sea service, to act under this general constitution, shall be nominated by the President-General; but the approbation of the Grand Council is to be obtained, before they receive their commissions. And all civil officers are to be nominated by the Grand Council, and to receive the President-General’s approbation before they officiate. 24. But, in case of vacancy by death or removal of any officer, civil or military, under this constitution, the Governor of the Province in which such vacancy happens may appoint, till the pleasure of the President-General and Grand Council can be known. 25. 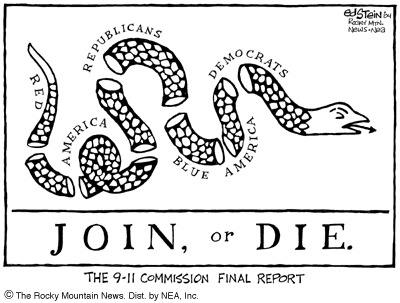 That the particular military as well as civil establishments in each Colony remain in their present state, the general constitution notwithstanding; and that on sudden emergencies any Colony may defend itself, and lay the accounts of expense thence arising before the President-General and General Council, who may allow and order payment of the same, as far as they judge such accounts just and reasonable.